A simple exercise can allow the eye, inner ear and brain to recalibrate after damage to the inner ear. 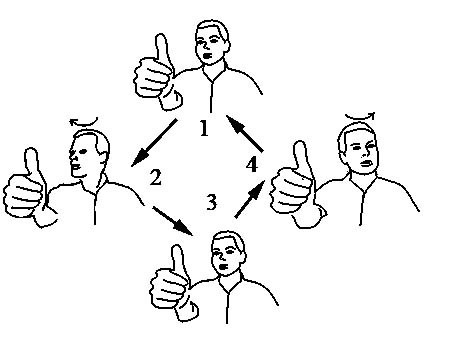 To do this exercise you will need to sit facing a blank wall and hold out your thumb straight in front of you (figure 1). Alternatively you can put a post-it type sticker on a wall 3 feet or 1 metre away marked with a “X”. At all times during this exercise keep your eyes fixed on your thumb or the “X” you have placed on a wall. Turn your head a little to the right (figure 2) and then to the left (figure 4). Rhythmically alternate turning ahead from the left to right and back again. The turn from left to right should take approximately 1 second. Turning your head from left to right should be smooth. The aim of the exercise is to turn your head but to keep your eyes fixed on one spot i.e. your thumb or X on the wall. Do the exercise for approximately 1 to 2 minutes. Carry out this exercise 3 to 4 times a day for one to two weeks. In most cases you will notice a benefit within one week. It is possible for the dizziness to return and you may need to repeat the exercise. You may feel nauseous or even dizzier immediately after doing this exercise. This does not mean you are doing the exercises incorrectly. Do not give up. The nausea is the body’s reaction to the malfunctioning inner ear. The brain will try and adapt, helping the recovery. If you feel ill/unwell for more than 30 minutes after the exercise you should slow down the speed of the head movements and/or the amount you turn your head. If you do not feel dizzy after the exercise then you need to do these more quickly or progress to other ways of doling the exercise as below. If you have a stiff neck you may need to move you head and shoulder together. In this case it is easier to place a post-it with an X on it on a wall rather than using you thumb. If you have managed to do the exercise easily while sitting, do the exercise while standing. Do the exercise while walking. Instead of a blank wall place you X or thumb against a busy background. While turning your head to the left move your thumb slightly to the right and vice versa. Do this initially sitting then progress to standing or walking (with or without a busy visual background). If you can do all of these you have done very well as most people with normal inner ear will struggle with these! Instead of moving your head from side to side, move you head up and down (nodding). If you are able to do all the above you are doing very well! Other exercises useful for balance training are described below. Initially try exercise 1 for 1-2 minutes. If you have no problems with this move to exercise 2. Again try this for 1-2 minutes. Progress through the exercises. If you have any difficulties with any of the exercises stay on the exercise you can manage. As you condition improves over days or weeks you can move to the more difficult exercises (3 and 4). If you can manage the simpler exercises easily you may wish to miss these and do the more complex exercises. If you have certain physical problems e.g. back problems or joint problems certain exercise may be impossible for you. Simply do the exercises you can manage. In some exercises you may need help from someone else. Repeat the exercise 2-3 times a day. You would expect an improvement with 2 weeks.